There's a divide in the city of Portland between those who wish to preserve and conserve and those who want to boost the economy. There's an invisible wall that encircles the city for roughly 30 miles and protects the surrounding forests and farms from urban sprawl. Every six years, soldiers on both sides of the battle reassess that boundary line based on population and employment for the next 20 years. In 2015, no additional ground was given up. The 2015 decision is accelerating a flock to the inner core of Portland, which inhibits construction of higher-density housing, but investors can flip distressed homes to fill the need. “They talk out of both sides of their mouth, and they say you can’t tear down that home and build four in its place — and you also can’t raise rents,” said Grubb, co-owner of Bulldog Capital Partners, who added that he is all for preserving quirky Portland properties with architectural significance provided that they are not beyond repair. The frontline of this civil war is an invisible wall encircling the city roughly 30 miles from downtown in all directions that protects the surrounding forests and farms from the otherwise inexorable urban sprawl. 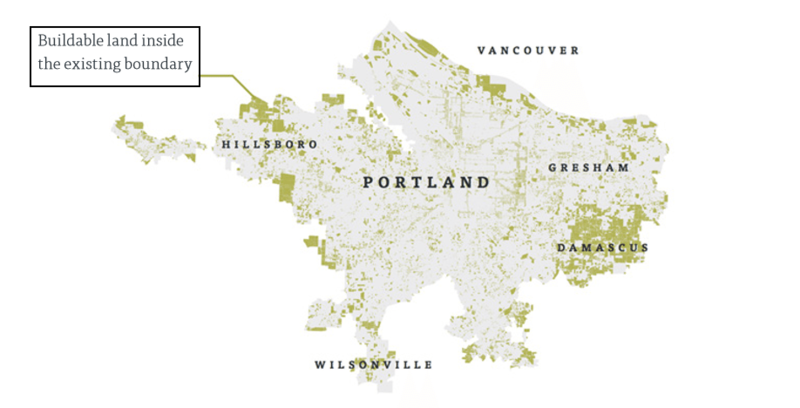 Called the Portland urban growth boundary, this barrier to new building is required by a 1973 state law to “control urban expansion onto farm and forest lands,” according to Metro, the Portland area regional government entity that manages the boundary. Every six years, soldiers on both sides of the civil war gear up for a major battle as the boundary line is reassessed based on forecasted population and employment for the next 20 years. One such reassessment battle occurred in 2015, with the boundary line giving up no additional ground. Read the entire Portland housing market story. In its fact sheet explaining the decision to keep the urban growth boundary status quo for another six years, the Metro Council explained that despite an expected influx of 400,000 people and 195,000 new households over the next 20 years, there is still enough land to build thanks to the new households being smaller and older, and a shift away from single family homes toward apartments. “Existing city and county plans — and the amount of vacant or developable land already inside the boundary — provide more than enough room for all the new housing we expect to need over the next 20 years,” the council wrote in its conclusion. The 2015 decision is helping accelerate a “flock to the inner core” of Portland, according to Grubb, whose company has been buying, fixing and flipping homes in Portland since 2012. People, mainly second-generation hipsters, are flocking to the inner core of Portland. Although it might inhibit his ability to create more inventory via infill construction of higher-density housing, the slow-growth philosophy in Portland is ultimately a good problem to have for Grubb because it helps him sell his product fast and at a premium price. “Everything that I put on the market comes in at asking or above … I can sell a derelict house on the MLS for full price,” he said, noting that his model works because he employs a full-time team devoted to finding, vetting and buying distressed properties at a discount — both at the foreclosure auction and by approaching homeowners of “vulnerable properties” directly. Employing such a team is a big investment on the property acquisition side that most newbie investors would not be able to afford. “Once you create that machine, you have to do those 15 properties a month or things go sideways,” Grubb said, adding that as it becomes tougher to find distressed properties at a discount in Portland, he is looking at a handful of other markets across the country where he can deploy his investing team. 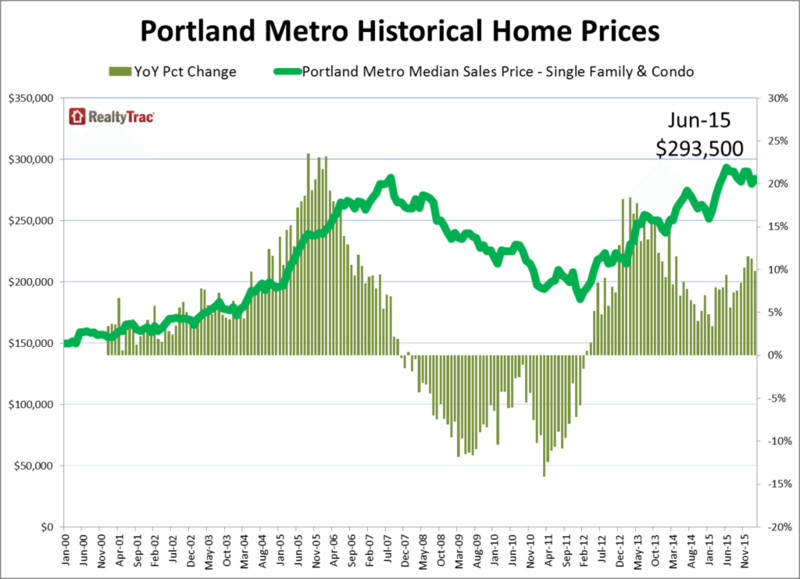 RealtyTrac data shows that while home flipping increased as a share of all sales in Portland in 2015, the average gross flipping profit declined as investors like Grubb were squeezed on the property acquisition side by the imbalance between supply and demand. Homes flipped in Portland in 2015 on average were purchased at a 19-percent discount below estimated full market value — well below the average purchase discount nationwide of 26-percent — while flipped homes in Portland sold at a 4-percent premium above estimated full market value — also below the average 5-percent premium nationwide. Flipped homes in Portland sold at a 4 percent premium above estimated full market value. The shrinking spread between purchase discount and sale premium added up to a shrinking average gross return on homes flipped in Portland: 36 percent in 2015, down from 47 percent in 2014 and below the average 46 percent gross return on homes flipped nationwide during the year. Although acquiring properties at a discount might be tough, selling those properties quickly to highly qualified buyers has been the easy part of the flipping formula in Portland, according to Grubb. He said most of his buyers are using cash or conventional financing — as opposed to FHA financing with a small down payment — evidence that those buyers are at low risk for default down the road. In Multnomah County, where Portland is located, 27 percent of all single-family home and condo sales were to all-cash buyers in 2015, up from 26 percent in 2014, according to RealtyTrac data. So far in 2016, the all-cash buyer share stands at 29 percent. Lack of wage growth hinders affordability across U.S.